I thought folks might be interested in seeing what the most popular posts on Kenny Kellogg were in 2009. 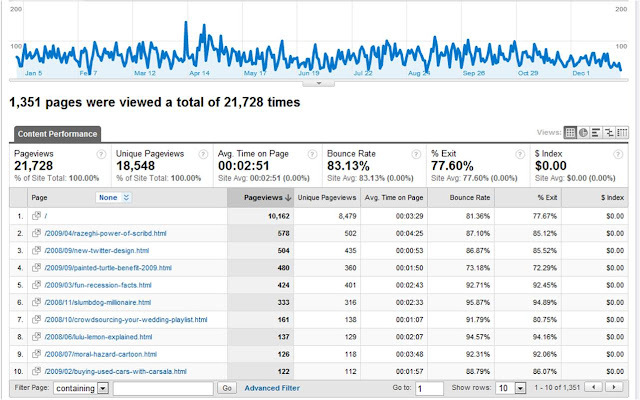 Here is a screen shot from Google Analytics which shows about 22k page views for the year which means about 60 people check out the site every day. Not too shabby. Btw - thanks for your support. It's great motivation to know that people read the site! The top 10 is below. 1. Razeghi & the Power of Scribd - the story of how my Kellogg Professor, Andrew Razeghi, used Scribd.com to publicize his thoughts on the recession. 2. New Twitter Design - Molly Mutt made me a new Twitter background and this rocked the Internet. Actually, this shows the power of Search Engine Optimization as I think a lot of people found the blog thinking they were getting a sneak peak at the new Twitter.com design. 3. Painted Turtle Benefit - a fundraiser for one of my favorite charities. I was happy to help raise awareness, plus it was an awesome time! Go next year. 4. Fun Recession Facts - a quick story about saving money by scooping the back out of hotel soap. More SEO at work here, although it's a riveting story and even led the Himmelsblog to create a tumblr page dedicated to pictures of hotel soap. 5. Slumdog Millionaire - great movie. I have a confession. The whole time I thought it was an Indie flick and kept thinking about how "flat" the world of filmaking had become. 7. Lulu Lemon - I'm convinced this will be a big company someday because people are gravitating towards wellness and sports that promote it. Still haven't bought the stock though. 8. Moral Hazard Cartoon - great cartoon and no shock that in a year of huge government bailouts, that Moral Hazard was something that people wanted to learn more about. 9. Carsala - my friends started this innovative way to buy used cars. Cool concept and great guys. 10. WWDDD - What would Don Draper do? The main character of my favorite show, Mad Men. So glad it made the Top 10. Thanks again for reading day after day!! !